I know it isn’t always easy to accomplish this one because, lets face it, you have no control over it what so ever. If you can’t verbally convince the other members of your household to comply maybe you can entice them with your success. Once they see how much more organised your spaces are and how happy it makes you, they may be more inclined to join in. When you tell them about your eBay successes and how your bank account is growing because of your retail restraint they may be convinced. Declutter your socks and underwear drawers ~ I don’t know about you but I tend to wear, wash and put these items back over and over and then when things start to wear out I avoid them and then they just languish in the drawer for months. So every now and again I do a little declutter. Some items I might replace but only if I don’t already have too many. 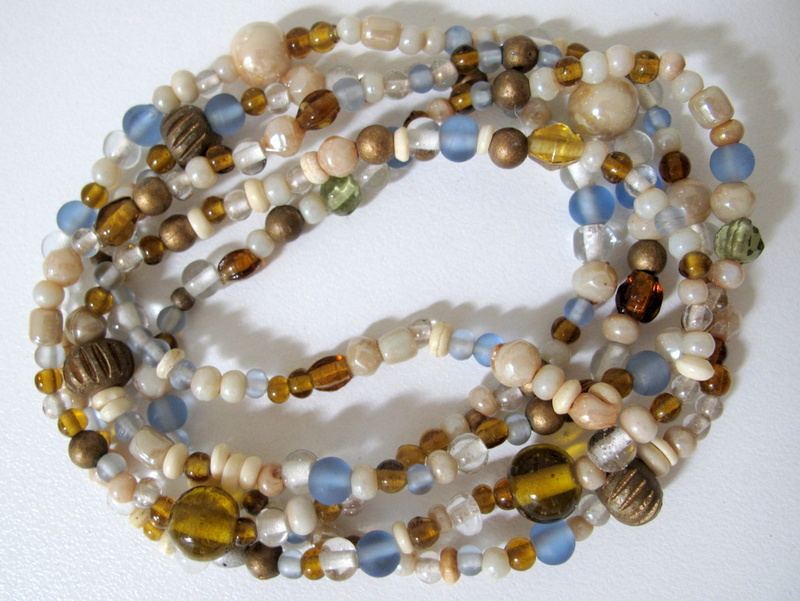 I was given these beads by my mother but twelve months later I had not used them for a project. In my bid to reduce my craft space these were one of the things donated to the thrift shop. Use a microfibre mop to clean your floors. All you need is a little water, no harmful chemicals. Even green cleaners have to be manufactured so why use them if you don’t need to. Socks are done, went through mine at the same time I went through my boyfriend’s with him. Got rid of 2 dozen holey or icky pairs between the two of us. Also got rid of a half dozen pairs of his underwear. Mine I’m working on the use-it-up sort of mindset. I’ve got a bunch of pairs that are “too nice” that I’m afraid of staining on accident, so I continue to wear my well-fitted, but already stained pairs. As the elastic gives on those though, they’ll go away. I’m not planning on buying any more (except for the occasional free pair I can snag from VS with a coupon), and they all fit, so I’ll hold off on getting rid of any. Now bras on the other hand… I think I will finally get rid of a few of those I’ve been holding onto for years as “just in case” ones. I can think of several I should just get rid of, because I never wear them. Boyfriend and I are going to have a MASSIVE Goodwill haul at some point. This is the dream. To have everyone on board at the same time. Now wouldn’t that be a treat?! Colleen, I would have jumped on those beads if I were in the thrift store. I just broke a set very similar – just love the blue and brown combo since I have a lot of blue and brown in my wardrobe. Most recently, I have been decluttering my husbands tee shirts (the working in the yard ones) and noticed that I missed one because when he came in from outside yesterday, the back of the one he had on was full of holes. He works with mortar and acid since he is building a wall in our backyard and I want him to wear the old shirts out there however, even the one he had on yesterday might have to GO! He doesn’t want me to toss anything but I find if I slip them out one by one, he doesn’t notice. Sock drawer for me this weekend. Actually, I have two that are crammed full so some really need to move on. Good reminder. My husband was the same way with “working around the house” shirts–even with holes, he didn’t want to get rid of them. That changed when he mowed the lawn one day and got a really bad sunburn just through the holes in his shirt. I didn’t have to convince him anymore that they would be better for the rag bag! Thanks for the Eco Tip reminder about microfibre mops Colleen. We’ve just bought a house (yay!) and it has gorgeous 100 year old recycled timber floors. I’ll definitely be buying a mop for them, as I envisage many pets (and people) coming in and out in our future!! I’ve been culling the kids’ socks lately too. They both have navy blue cotton socks for school, which I bought over 2 years ago, and they are all wearing out at the same time. I think all of my household members are on board, luckily. They have little attachment to most things, and what they do have attachment to, they use all of the time. I am the only female in the house, so some things that are dear to me, are not necessarily dear to everyone else, but I am working on letting go of things, a little every day gets me closer to where I want to be. I like your mini mission. I recently had a complete revamp of my sock drawer because, although I buy all plain black socks so that missing socks don’t cause a problem, over the years they had ended up in various shades of grey. It took a friend commenting on my socks (yes, it was that bad!) for me to realise and it really was time to put the lot into the dusting/polishing pile and start fresh!